Adamson. R. 1924 Private Robert Adamson 1/7th Battalion Northumberland Fusiliers, Killed in Action France and Flanders, 3rd January 1916 aged 23. Born Amble, enlisted Alnwick. Son of William and Elizabeth Adamson, of 17, North View, Amble, Northumberland. Buried Cite Bonjean Military Cemetery, Armentieres France. Aitchison. W. J. 33214 Private William John Aitchison Machine Gun Corps (Infantry) 4th Company. Killed in Action. 4th November 1917. 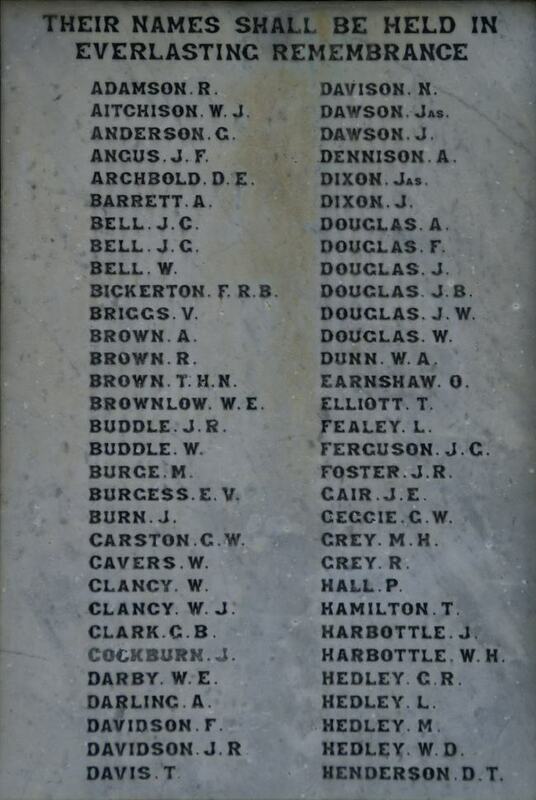 Commemorated panel 55 of the Jerusalem Memorial, Palestine (now Israel) Aitchison formerly 1768 Northumberland Fusiliers. Angus. J. F. TS-8939 Driver/Shoeing Smith Joseph Frederick Angus, Royal Army Service Corps. Died 19th February 1920 Age 29. Son of John Stewart Angus and Alice Angus. Buried Amble West Cemetery. Barrett. A. 7/836 Private Alfred James Barrett, 1st/7th Bn. Northumberland Fusiliers. Killed in Action 8th September 1915 aged 28. Son of Charles and Mary Jane Barrett, of Alnmouth; husband of Sarah Ann Barrett, of 21, Albert Street, Amble, Morpeth, Northumberland. Buried Chapelle-D'armentieres Old Military Cemetery, Nord, France. Bell. J. G. 33150 Lance Corporal John George Bell, 12th Bn. Northumberland Fusiliers. Killed in Action 8th November 1916 aged 31. Brother of Miss Margaret J. Bell, of 17, Percy St., Amble, Morpeth. Buried Vermelles British Cemetery, Pas de Calais, France. Bell. W. probably......33052 Private William Bell, 10th Bn. Yorkshire Regiment. Killed in Action 22nd September 1916. Commemorated Thiepval Memorial, Somme, France. Born Chevington, enlisted Alnwick. Bickerton. F. R. B. 70845 Private Fielding Raymond Brigham Bickerton, 15th Bn. Durham Light Infantry. Killed in Action 24th August 1918 Son of R. Brigham Bickerton and Rachel Bickerton, of Greenfield Terrace, Amble, Northumberland. Buried Regina Trench Cemetery, Grandcourt, Somme, France. Born Alnwick, enlisted Elswick, resided West Benwell Newcastle. Briggs. V. 15625 Private Valentine Briggs, 6th Bn. Somerset Light Infantry, Killed in Action 22nd August 1917 aged 31. Son of James and Elizabeth Briggs; husband of Christina Freeman (formerly Briggs), of 9, Lime St., Amble, Northumberland. Commemorated Tyne Cot Memorial, Zonnebeke, West-Vlaanderen, Belgium. Son of James and A. J. Brown, of 14, Gordon St., Amble, Northumberland. Buried Bermeries Communal Cemetery, Nord, France. Probably....20210 Private William Ernest Brownlow 1st Bn. King's Own Scottish Borderers. Killed in Action 26th December 1915 aged 20. Son of James Albert and Martha Brownlow, of Workington, Cumberland; husband of Elizabeth Jane Brownlow, of 35, Sidney St., Blyth, Northumberland. Buried Twelve Tree Copse Cemetery, Gallipoli, Turkey. Burgess. E. V. 33121 Lance Corporal Edwin Vincent Burgess, 2nd Bn. Border Regiment. Died 7th February 1917 aged 23. Born at Kincardine, Fife. Son of Robert James and Minnie Eleanor Burgess, of Beaconsfield Terrace, Amble, Northumberland. Buried Hem Communal Cemetery, Somme, France. Carston. G. W. 202910 Private George William Carston 27th (Tyneside Irish) Bn. Northumberland Fusiliers. Killed in Action 28th April 1917 Commemorated Arras Memorial, Pas de Calais, France. Born Alnwick, enlisted Amble. Cavers. W. 19/783 Private Watson Cavers, 19th Bn. Northumberland Fusiliers (transf. to 80th Bn. Training Reserve). Died 2nd January 1917 aged 24. Son of Watson and Hannah Cavers, of Panhaven Rd., Amble. Buried Amble West Cemetery. Born Amble, enlisted Newcastle. Clancy. W. J. (spelling?) 953 Serjeant William Joseph Clancey, 1st/7th Bn. Northumberland Fusiliers. Killed in Action 15th September 1916. Commemorated Thiepval Memorial, Somme, France. Born Portland Dorset, enlisted Amble. A Miner ; born 12th May 1894 ; Next-of-Kin & home address: Father, John, 4 Dovecote St., Amble, Northumberland. Davidson. F. 203096 Lance Corporal Francis Davidson, 1st Battalion Northumberland Fusiliers, died of wounds 28th September 1918. Buried Grevillers British Cemetery, Pas de Calais. Lived Scott Street, Amble. Davidson. J. R. 4146 John Robert Davidson, 8th Bn. Northumberland Fusiliers. Died 19th August 1915. Commemorated Helles Memorial, Gallipoli, Turkey. Born Amble, enlisted Newcastle. Davis. T. R/20074 Lance Corporal Thomas Davis, 8th Bn. King's Royal Rifle Corps. Died of Wounds 3rd May 1917 aged 20. Son of Mr. and Mrs. William Davis, of 33, Wellwood St., Amble, Morpeth, Northumberland. Dawson. Jas. TZ/649 Able Seaman James Dawson, Collingwood Bn. Royal Naval Volunteer Reserve. Killed in Action 4th June 1915 aged 19. Commemorated Helles Memorial Gallipoli Turkey. Enlisted 25/10/1914 ; Collingwood Bn. 'A' Company 4th Platoon 4/2/15-4/6/15 Discharged Dead. Born 2/10/1895. A Miner. Son of George and Ellen Dawson, of 8 George St., Amble, Northumberland. Resided with parents on enlistment. Dawson. J. 16905 Serjeant John Dawson, 7th Bn. Somerset Light Infantry. Killed in Action 30th November 1917. Commemorated Cambrai Memorial, Louverval, Nord, France. Born and enlisted Amble. Dixon. J. 17196 Private John Dixon, 1st Bn. Northumberland Fusiliers. Killed in Action 14th July 1916. Commemorated Thiepval Memorial, Somme, France. Born and enlisted Amble. Douglas. A. 27650 Private Andrew Douglas, 8th Bn. Border Regiment, Died of Wounds 29th April 1918 aged 23. Brother of M. Douglas, of 9, George St., Amble, Northumberland. Buried Boulogne Eastern Cemetery, Pas de Calais, France. Douglas. J. 108924 John Douglas, 27th Battalion Durham Light Infantry. Died 9th July 1918. Buried Amble West Cemetery. Enlisted Amble. Douglas. J. B. (correct spelling is Douglass) 2425 Private John Brydon Douglass, 1st/7th Bn. Northumberland Fusiliers. Killed in Action 15th September 1916. Buried Adanac Military Cemetery, Miraumont, Somme France. Douglas. J. W. (Also Douglass?) 16244 Lance Corporal John William Douglass, 11th Bn. Northumberland Fusiliers. Died of Wounds 27th September 1916 aged 27. Son of the late John and Margaret Douglass, of North Broomhill, Acklington, Northumberland. Buried Dernancourt Communal Cemetery Extension, Somme France. Born Chevington, enlisted Amble. Douglas. W. Possibly......20/1032 Private William Farrow Douglas, 20th (Tyneside Scottish) Bn. Northumberland Fusiliers. Killed in Action 1st Day of the Battle of the Somme, 1st July 1916. Commemorated Thiepval Memorial, Somme France. Born and enlisted Amble. 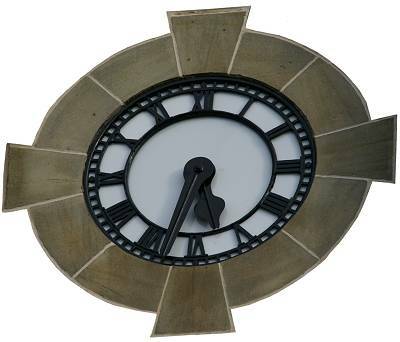 Earnshaw. O. Second Lieutenant Oscar Earnshaw Royal Engineers. Killed in Action 2nd June 1916 Commemorated Ypres (Menin Gate) Memorial Belgium. Formerly 482 Sergeant, Northumberland Hussars Yeomanry. Ferguson. J. G. 22128 Private John George Ferguson, 24th (Tyneside Irish) Bn. Northumberland Fusiliers. Died 28th April 1917 aged 20. Son of George and Margaret Ferguson, of 13, Scott St., Amble, Northumberland. Commemorated Arras Memorial, Pas de Calais, France. Foster. J. R. 35218 Private James Robert Foster 12th/13th Bn. Northumberland Fusiliers. Died 21st March 1918 Buried Croisilles British Cemetery, Pas de Calais, France. Born Amble, enlisted Chevington. Gair. J. E. 277216 John Edward Gair, 7th Bn. Durham Light Infantry, Killed in Action 22nd August 1917 aged 22. Son of Thomas Stafford Gair and Eleanor Gair, of 2, Broomhill St., Amble, Morpeth, Northumberland. Commemorated Henin Communal Cemetery Extension, Pas de Calais, France. Formerly 18/1692 Northumberland Fusiliers. Geggie. G. W. 2362 Private George William Geggie, 1st/7th Bn. Northumberland Fusiliers. Died 26th April 1915 aged 23. Son of George and Joanna Geggie, of Blue Bell Hotel, Amble, Morpeth, Northumberland. Commemorated Ypres (Menin Gate) Memorial, Belgium. Grey. M. H. 245284 Martin Henry Grey, 10th Bn. Durham Light Infantry. Died of Wounds 29th October 1917 aged 19. Son of Thomas and Margaret Isabella Grey, of 6, Blackwood St., Amble, Northumberland. Buried Lijssenthoek Military Cemetery, Poperinge, West-Vlaanderen, Belgium. Formerly 2232 Yorkshire Regiment. Born Craster enlisted Amble. Hamilton. T. 267203 Private Thomas Hamilton, 1st/6th Bn. Northumberland Fusiliers. Died 2nd April 1918. Commemorated Pozieres Memorial, Somme, France. Harbottle. J. 15815 Corporal James Harbottle, 8th Bn. Somerset Light Infantry. Killed in Action, 10th April 1917. Commemorated Arras Memorial, Pas de Calais, France. Born Chevington, enlisted Amble. Harbottle. W. H. 2414 Private William Henry Harbottle, 1st/7th Bn. Northumberland Fusiliers. Killed in Action 1st June 1915 aged 19. Son of Thomas and Elizabeth Harbottle, of 20, Middleton St., Amble, Northumberland. Buried Hop Store Cemetery, Ypres Belgium. Buried Railway Dugouts Burial Ground, Ypres, West-Vlaanderen, Belgium. Henshall. R. H. 89092 Private Robert Hetherington Henshall, 92nd Field Ambulance, Royal Army Medical Corps. Died of Wounds 15th August 1917. Son of Mr. J. Henshall, of 3, Prospect Terrace, Amble, Northumberland. Buried Adinkerke Military Cemetery, De Panne, West-Vlaanderen. Born Amble, enlisted Gateshead, lived Newcastle. Horn. W. J. 18/1598 Private William James Horn, 18th Bn. Durham Light Infantry. Killed in Action 17th May 1917 aged 20. Son of James and Christiania Horn, of 8, Oswald St., Amble, Northumberland. Commemorated Arras Memorial, Pas de Calais, France. 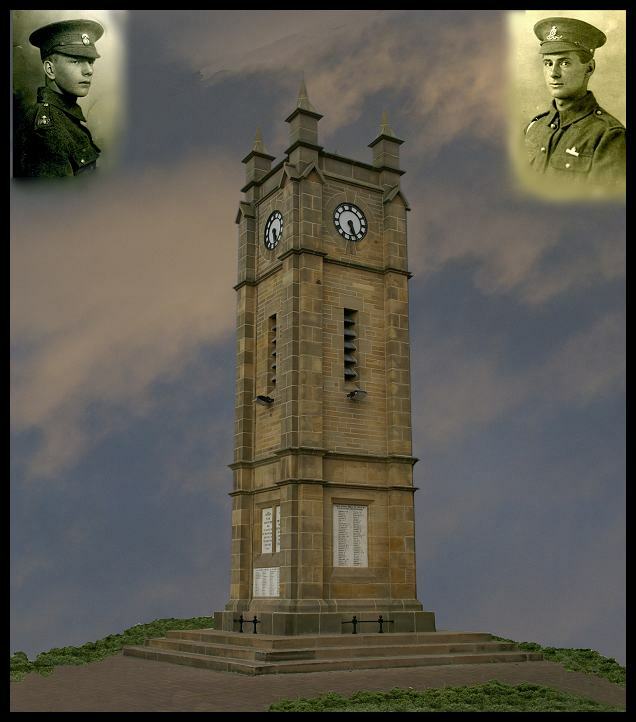 Born and lived Amble, Northumberland, enlisted West Hartlepool. Horner. G. 5615TS Trimmer George Robert Horner, H.M. Trawler "Robert Smith." Royal Naval Reserve. Killed in Action 20th July 1917 aged 26 Son of George and Ellen Horner, of 63, Gordon St., Amble, Northumberland. Native of Warkworth. Commemorated Chatham Naval Memorial, Kent, UK. Luckhurst. F. J. T.Z. 3026 Able Seaman Frederick James Luckhurst, Drake Bn. R.N. Div. Royal Naval Volunteer Reserve. Died of Wounds 13th November 1916 aged 24. Son of William Luckhurst, of 2, Henderson St., Amble, Northumberland. Buried Warloy-Baillon Communal Cemetery Extension, Somme France. Died of wounds in 2/1st South Midland Casualty Clearing Station Special Hospital Warloy. Luckhurst was born 29th February 1892, and a bricklayer in civilian life. Medals issued to Father. Lyall. W. E. M. 66777 Corporal William Edward Melrose Lyall, 12th/13th Bn. Northumberland Fusiliers. Died 18th April 1918 aged 18. Son of John Hugh Lyall, of 52, Church St., Amble, Morpeth, Northumberland, and the late Jane Ann Lyall. Commemorated. Tyne Cot Memorial, Zonnebeke, West-Vlaanderen, Belgium. MacDougal. J. 23/100 Private John Anderson McDougal 23rd (Tyneside Scottish) Bn. Northumberland Fusiliers. Died 27th August 1915 aged 22. Son of John and Mary McDougal, of 31, Scott St., Amble, Northumberland. Buried Hull (Hedon Road) Cemetery, Yorkshire, UK. Mackay. A. 2435 Alexander MacKay, 1st/7th Bn. Northumberland Fusiliers. Died 26th April 1915 aged 34. Son of William McKay, of 16, Dansfield Place, Radcliffe, Northumberland, and the late Dorothy MacKay; husband of Mary A. MacKay, of 25, Church St., Amble, Morpeth, Northumberland. Commemorated Ypres (Menin Gate) Memorial, Ypres, Belgium. Merivale. F. Lieutenant Francis Merivale, 1st/7th Bn. Northumberland Fusiliers. Died 17th October 1918, aged 23. Son of John Herman Merivale and Blanche Merivale. Buried St. Sever Cemetery Extension, Rouen, Seine-Maritime France. Merivale. J. W. Captain John William Merivale, "A" Coy. 1st/7th Bn. Northumberland Fusiliers. Killed in Action 15th September 1916 aged 29. Son of Professor John H. Merivale and Blanche Merivale. Buried Bazentin-Le-Petit Communal Cemetery Extension. Miller. H. J. 4188 Private Henry John Miller, 8th Bn. Northumberland Fusiliers. Killed in Action 7th August 1915 aged 23. Son of George and Mary Ann Miller, of Acklington, Morpeth, Northumberland. Native of Amble, Northumberland. Commemorated Helles Memorial, Gallipoli, Turkey. Morton. W. 66694 Private William Morton, 1st/6th Bn. Northumberland Fusiliers. Died 11th April 1918 aged 18. Son of Mary Ewart (formerly Morton), of Link House, Amble, Northumberland, and the late H. Morton. Buried Croix-Du-Bac British Cemetery, Steenwerck, Nord, France. Mossman. R. S. 885 Serjeant Robert Stephen Mossman, 1st/7th Bn. Northumberland Fusiliers. Died 26th April 1915. Mossman. W. T. 70909 Private William Mossman, 6th Bn. Machine Gun Corps (Infantry). Killed in Action 21st March 1918 aged 30. Son of Mrs. Elizabeth Mossman, of 51, Wellwood St., Amble; husband of Florence Mossman, of 4, Smith St., Amble, Northumberland. Commemorated Arras Memorial, Pas de Calais, France. Murray. C. E. (Probably should be G.E. Murray.? ): KX/348 Able Seaman George Ernest Murray, Hood Bn. Royal Naval Volunteer Reserve. Killed in Action 6th May 1915. Commemorated Helles Memorial Gallipoli Turkey. Enlisted in the Northumberland Fusiliers 2/9/14 & transferred to the RNVR 9/9/14 ; Hood Bn. B/255 9/9/14-6/5/15 Dischaged Dead. Born Morpeth 11/9/1888. A Mason. Resided at 1 Edwin St., Amble, Northumberland. Next-of-Kin: Aunt, Miss Jane Darling, 40 Marine Rd., Amble, Northumberland. Formerly served 1 year in 7th Bn. Northumberland Fusiliers “E” Company ; 1914 Star issued to brother, Mr. R.A. Murray, 30/8/19, V.B. issued to Brother. Oliver. G. 64391 Gunner George Oliver, 91st Siege Bty. Royal Garrison Artillery. Died of Wounds 21st March 1918. Son of Robert and Mary Oliver, of 27, Scott St., Amble, Morpeth. Commemorated Pozieres Memorial, Somme France. Ormston. A. 245301 Private Albert Ormston 10th Bn. Durham Light Infantry, Died of Wounds 23rd August 1917 aged 20. Son of William and Mary Ormston. Born Amble, Northumberland. Buried Lijssenthoek Military Cemetery, Poperinge, West-Vlaanderen, Belgium. Formerly 204395 Yorkshire Regiment. Born Embelton, enlisted Amble. Pattison. J. W. 23/871 Private James William Pattison, 23rd (Tyneside Scottish) Bn. Northumberland Fusiliers. Killed in Action, 1st day of the battle of the Somme, 1st July 1916 aged 30. Husband of Annie Charlotte Pattison, of 9, Greenfield Terrace, Amble, Morpeth, Northumberland. Commemorated Thiepval Memorial, Somme France. Pringle. R. H. 3771 Private Robert Henry Pringle, "D" Coy. 1st/7th Bn. Northumberland Fusiliers. Killed in Action 14th November 1916 aged 24. Only son of Isabella Matthews (formerly Pringle), of 13, Edwin St., Amble, Morpeth, Northumberland, and the late Henry James Pringle. Buried Warlencourt British Cemetery, Pas de Calais, France. Roberts. G. D. 19/93 Corporal Robert George Duncan Roberts, 24th (Tyneside Irish) Bn. Northumberland Fusiliers. Died of Wounds 7th October 1917 aged 33. Son of the late John Hooson Roberts and Mary Roberts, of Amble, Northumberland. Buried Tincourt New British Cemetery, Somme, France. Robertson. A. W. 130949 Sapper Arthur William Robertson, 29th Light Railway Operating Coy. Royal Engineers. Killed in Action 31st October 1917 aged 27. Son of Henry and Mary Robertson, of Amble, Northumberland. Buried Solferino Farm Cemetery, Ypres, Belgium. Rollo. D. 2635 Private David Rollo 1st/7th Bn. Northumberland Fusiliers. Killed in Action 15th September 1916. Commemorated Thiepval Memorial, Somme, France. Enlisted Alnwick. Ross. A. 53268 Adam Ross 57th Field Amb Royal Army Medical Corps, (attached to 2nd Bn. Bedfordshire Regiment) Killed in Action 11th September 1917 aged 24. Son of George and Jane Rachel Ross, of 31, Wellwood St., Amble, Northumberland. Buried Oosttaverne Wood Cemetery, Heuvelland, West-Vlaanderen, Belgium. Also commemorated on a family headstone Amble East Cemetery. 242124 John Taylor Rutter, 1st/5th Bn. Northumberland Fusiliers. Killed in Action 26th October 1917 aged 28. Son of Thomas Rutter, of Sea Houses, Northumberland; husband of Jane Rutter, of 55, Gordon St., Amble, Northumberland. Commemorated on the Tyne Cot Memorial, Zonnebeke, West-Vlaanderen Belgium. Rutter. T. Serjeant 4192 Thomas Rutter, 8th Bn. Northumberland Fusiliers. Died of Wounds 26th September 1916 aged 28. Son of Robert and Mary Rutter, of 23, Gordon St., The Harbour, Amble, Northumberland. Buried Courcelette British Cemetery, Somme, France. Scott. J. 15890 Private John York Scott, 8th Bn. Somerset Light Infantry. Killed in Action 14th July 1917 aged 30. Son of John and Margaret Scott, of 7, Greensfield Terrace, Amble, Northumberland. Buried Cabin Hill Cemetery, Heuvelland, West-Vlaanderen Belgium. Born and enlisted Amble. Formerly 14146 Northumberland Fusiliers. Smetham. E. 11/14290 Corporal Ernest Smetham, 11th Bn. Northumberland Fusiliers. Died of Wounds 21st September 1917 aged 23. Son of John and Elizabeth Smetham, of 20, Bridge St., Amble, Acklington, Northumberland. Buried Lijssenthoek Military Cemetery, Poperinge, West-Vlaanderen, Belgium. Born and Enlisted Amble. Spowart. M. 12857 Corporal Mark Spowart 13th Bn. Northumberland Fusiliers. Died of Wounds 11th August 1917. Buried Achiet-Le-Grand Communal Cemetery Extension, Pas de Calais France. Born Choppington, enlisted Amble. Stewart. W. 18243 Private Wilson Stewart, 1st Bn. Northumberland Fusiliers. Killed in Action 23rd October 1918 aged 21. Son of Robert Stewart, of 5, Victoria St., Amble, Northumberland. Commemorated Vis-En-Artois Memorial, Pas de Calais, France. Enlisted York. Commemorated Thiepval Memorial, Somme, France. Born St. Andrew’s, Bishop Auckland, Durham. Enlisted Newcastle, resided Amble Northumberland. Straughan. J. E. 1477 Private J. E. Straughan 1st/7th Bn. Northumberland Fusiliers. Died 18th October 1918 aged 23. Stuart. M. R. 204398 Private Matthew Robert Stuart 4th Bn. Yorkshire Regiment. Died 22nd September 1918 aged 22. Son of Mrs. Sarah Stuart, of 55, Gordon St., Amble, Northumberland. Buried Glageon Communal Cemetery Extension. Born and enlisted Amble. Tait. A. 12801 Serjeant Adam Tait D.C.M, 12th/13th Bn. Northumberland Fusiliers. Killed in Action 27th April 1918. Commemorated on the Tyne Cot Memorial, Zonnebeke, West-Vlaanderen Belgium. Born Alnwick, enlisted Amble. Tait. E. H. 2527 Edward Henderson Tait, 1st/7th Bn. Northumberland Fusiliers. Killed in Action 19th June 1915 aged 22. Son of James Tait, of Linton Colliery, Northumberland; husband of Eleanor Shotton Tait, of 17, Queen St., Amble, Northumberland. Commemorated Ypres (Menin Gate) Memorial, Belgium. Enlisted Alnwick. Taylor. T. TZ/777 Leading Seaman Thomas Taylor, Howe Bn. R.N. Div. Royal Naval Volunteer Reserve. Killed in Action 13th November 1916 aged 21. Son of George and Mary Jane Taylor, of Acklington Rd., Amble, Morpeth, Northumberland. Commemorated Thiepval Memorial, Somme France. Enlisted 19/10/14 ; Collingwood Bn. 'B' Company 3rd Platoon 4/2/15, transferred to Howe Bn. 8/6/15-13/11/16 Discharged dead. A Grocer in civilian life born 4th June 1894 ; Next-of-Kin & home address: Father, George, 6 Acklington St., Amble, Northumberland. Tindall. P. 242311 Private Peter Tindal, 1st/5th Bn. Duke of Wellington's (West Riding Regiment). Killed in Action 14th August 1917 Aged 21. Son of Mr. and Mrs. R. Tindal, of 21, Northumbria Terrace, Amble, Northumberland. Native of Duns, Berwickshire. Buried Coxyde Military Cemetery, Koksijde, West-Vlaanderen, Belgium. Trobe. J. 33597 Private John Trobe 1st/4th Bn. York and Lancaster Regiment. Died of Wounds 19th October 1917 aged 35. Son of John and Elizabeth Trobe, of Hartlaw, Acklington, Northumberland; husband of Catherine Ann Trobe, of 9, Church Street, Amble, Northumberland. Buried Nine Elms British Cemetery. Enlisted Shilbottle Northumberland, resided Acklington. Trotter. G. 2659 Private George Trotter, 1st/7th Bn. Northumberland Fusiliers. Killed in Action 29th May 1915 aged 21. Son of William and Margaret Trotter, of Hope Terrace, Amble, Northumberland. Commemorated Ypres (Menin Gate) Memorial, Belgium. Enlisted Alnwick. Turnbull. J. J/76823 Boy Telegraphist James Turnbull, : H.M.S. "Ganges." Royal Navy, Died 10th February 1918 aged 17.Son of the late Cuthbert and Catherine Turnbull, of Amble, Northumberland. Buried Shotley (St. Mary) Churchyard, Suffolk. Turnbull. N. 18632 Private Norman Turnbull, 13th Bn. Northumberland Fusiliers. Killed in Action 18th July 1916. Born and Enlisted Amble Northumberland. Commemorated on the Thiepval Memorial, Somme, France. Turnbull. R. H. 61796 Gunner Robert Henry Turnbull, 15th Siege Bty. Royal Garrison Artillery. Died of Wounds 25th April 1916 aged 30. Son of the late Cuthbert and Katherine Turnbull, of Amble; husband of Jane Turnbull, of 29, Gordon St., Amble, Northumberland. Three Brothers died in the war, 2 in France, 1 in the Navy School. Waller. J. G. 42380 Corporal John George Waller, 1st Bn. North Staffordshire Regiment. Died of Wounds 15th October 1918 aged 19. Son of Sarah Watson (formerly Waller), of 22, Ridley St., Cramlington, Northumberland, and the late George Waller. Buried Cambrai East Military Cemetery. Born Acklington Northumberland , enlisted Amble. Wilson. J. 38092 Private John Wilson 23rd (Tyneside Scottish) Bn. Northumberland Fusiliers. Died of Wounds 12th June 1917 aged 23. Son of James Wilson, of Gloster Hill, Amble, Morpeth. Buried Duisans British Cemetery, Etrun, Pas de Calais, France. Wintrip. J. 315332Serjeant John Wintrip, 12th/13th Bn. Northumberland Fusiliers. Killed in Action 25th October 1918 aged 27. Son of George and Mary Wintrip. Buried Romeries Communal Cemetery Extension. Born and enlisted Amble. Bain. T. Fireman Thomas Bain, S.S. "Ottokar" (London) Mercantile Marine, aged 43. Died 11th December 1917. Son of Ann Bain, and the late Robert Bain; husband of Elizabeth Bain (formerly Nicholson, nee Tait), of 104, Elizabeth Terrace, Westoe, South Shields. Born at Warkworth. Commemorated Tower Hill Memorial, London. Coulson. R. 2nd Engineer Robert Coulson, H.M.H.S. "Llandovery Castle" (London) Mercantile Marine Died 27th June 1918 aged 25 Son of John Edward and Annie Rebecca Coulson (nee Lewis), of 2, Co-operative Terrace, Pegswood, Morpeth, Northumberland. Born at Amble, Northumberland. Commemorated: Tower Hill Memorial, London. Allan. W. 5777941 Private William Allan, 8th (H.D.) Bn. Royal Norfolk Regiment. Died 26th November 1941. Aged 47 Husband of Elizabeth Allan, of Amble. Buried Amble West Cemetery. Anderson. C. E. Able Seaman Charles Ernest Anderson, S.S. Togston (Newcastle-on-Tyne) Merchant Navy. Died 8th March 1941 aged 30. Son of Charles and Rachael Anderson; husband of Alice Ann Anderson, of Amble, Commemorated Tower Hill Memorial, London. Anderson. J. W. Chief Engineer Officer John William Anderson, S.S. Edwin T. Douglas (St. Catharine, Ontario) Merchant Navy. Died 19th May 1944 aged 56. Son of John William and Annie Anderson, of Amble; husband of Janet Buried Amble West Cemetery. Armstrong. J. Able Seaman John Robinson Armstrong, S.S. Togston (Newcastle-on-Tyne) Merchant Navy. Died 8th March 1941 aged 21. Son of Mr. and Mrs. J. R. Armstrong, of Amble, Northumberland. Commemorated Tower Hill Memorial, London. Bell. J. 7908548 Trooper John Robert Bell, 51st (The Leeds Rifles) Royal Tank Regiment, R.A.C. Died 23rd May 1944 aged 24. Son of Robert and Margaret Bell, of Amble, Northumberland. Buried Cassino War Cemetery, Italy. Brown. J. 1742443 Bombardier John Brown, 6 Bty., 3 Maritime Regt, Royal Artillery. Died 25th February 1943 aged 40. Son of John and Bellilah Agnes Brown, of Amble, Northumberland. Buried Calcutta (Bhowanipore) Cemetery, Kolkata, India. Brown. J. Deck Hand James Brown, Dredger Coquet Mouth (Newcastle-on-Tyne) Merchant Navy. Died 4th July 1940, husband of Annie Jane Brown of 45 Panhaven Road, Amble. Their son was the master of the Empire Statesman and died when it was sunk in December of the same year. Mrs Brown later moved to Linthorpe, Middlesborough. Brown. J. Third Officer James Brown, M.V. Empire Statesman (Leith) Merchant Navy. Died 5th December 1940 aged 20. Son of James and Aileen Nora Brown, of Amble, Northumberland. Lived at 3 Gordon Street, Amble. Commemorated Tower Hill Memorial, London. Brown. J. S. Able Seaman John Stonehouse Brown, S.S. Medjerda (Swansea) Merchant Navy. Died 17th March 1941 aged 20. Son of Benjamin Brown, and of Amy Brown, of Amble, Northumberland. Commemorated Tower Hill Memorial, London. Chrisp. R. 982230 Sergeant (W.Op./Air Gnr.) Robert Brown Chrisp, 144 Sqdn. Royal Air Force Volunteer Reserve. Died 31st July 1941 aged 22. Son of George Brown Chrisp and Francis Chrisp, of Amble, Northumberland. Buried Cambrai (Route De Solesmes) Communal Cemetery, Nord France. Coates. C. 1087486 Gunner Cecil Coates, 76 Anti-Tank Regt. Royal Artillery. Died between the 21st January and the 20 May 1942 aged 34. Son of G. T. W. and Annie Coates, of Amble, Northumberland. Commemorated Alamein Memorial, Egypt. Coulson. R. Chief Engineer Officer Robert Coulson, S.S. British Venture (London) Merchant Navy. Died 24th June 1943 aged 37. Son of Edward and Mary Ann Coulson; husband of Rena Coulson, of Amble, Northumberland. Commemorated Tower Hill Memorial, London. Cram. G. E. 328838 Trooper George Edward Cram, 'C' Sqn. Staffordshire Yeomanry Royal Armoured Corps. Died 24th October 1942 aged 22. Son of George and Catherine Cram, of Amble, Northumberland. Commemorated El Alamein War Cemetery, Egypt. Darling. G. (C.?) ????? C/KX 132024 Stoker 1st Class Cecil Darling, H.M. Submarine Turbulent. Died 23rd March 1943 aged 22. Davis. T. Able Seaman Thomas Davis, M.V. Empire Statesman (Leith) Merchant Navy. Died 5th December 1940 aged 31. Son of Thomas and Elizabeth Davis; husband of Isabel Winifred Davis, of Amble, Northumberland. Commemorated Tower Hill Memorial, London. Douglas. W. 4273547 Fusilier Wilfred Douglas, 9th Bn. Royal Northumberland Fusiliers. Died 11th August 1943 aged 22. Son of Ormund and Isabella Douglas, of Amble, Northumberland. Buried Thanbyuzayat War Cemetery, Burma. Earnshaw. G. 2114714 Sapper George Earnshaw, 65 Chemical Warfare Company Royal Engineers. Died 12th December 1942 aged 22. Son of Albert Edwin and Margaret Jane Earnshaw, of Amble, Northumberland. Buried El Alamein War Cemetery, Egypt. Hall. C. 1119175 Lance Bombardier Charles Hall, 160 Field Regt. Royal Artillery. Died 21st January 1945 agd 35. Son of Richard and Mary Hall; husband of E. Hall, of Amble, Northumberland. Commemorated Rangoon Memorial, Burma. Hastie. J. L. Second Engineer Officer James Linton Hastie, M.V. Glenmoor (London) Merchant Navy. Died 27th November 1940 aged 45. Son of William and Eliza Hastie; husband of Jane Featherstone Hastie, of Amble, Northumberland. Commemorated Tower Hill Memorial, London. Hewitson. R. 1858388 Lance Corporal Robert Hewitson, 173 Tunnelling Coy. Royal Engineers. Died 16th December 1941 aged 42. Son of James and Martha Elizabeth Hewitson, of Amble, Northumberland; husband of Mary Hewitson, of Amble. Buried Pembroke Military Cemetery, Malta. Son of David and Frances J. Kay, of Amble, Northumberland. Buried Salouel Communal Cemetery, Somme France. Lockey. S. Deck Hand Sydney Lockey, Dredger Coquet Mouth (Newcastle-on-Tyne) Merchant Navy. Died 4th July 1940 aged 35. Son of John George and Mary Hannah Lockey, of Amble, Northumberland. Commemorated Tower Hill Memorial, London. Mossman. R. Steward Robert Stephen Mossman, S.S. Togston (Newcastle-on-Tyne) Merchant Navy. Died 8th March 1941 aged 20. Son of Albert Scott Mossman and Jessie Mossman, of Amble, Northumberland. Commemorated Tower Hill Memorial, London. Mossman. W. Able Seaman William Cook Mossman, S.S. Hauxley (Newcastle-on-Tyne) Merchant Navy. Died 17th October 1940 aged 20. 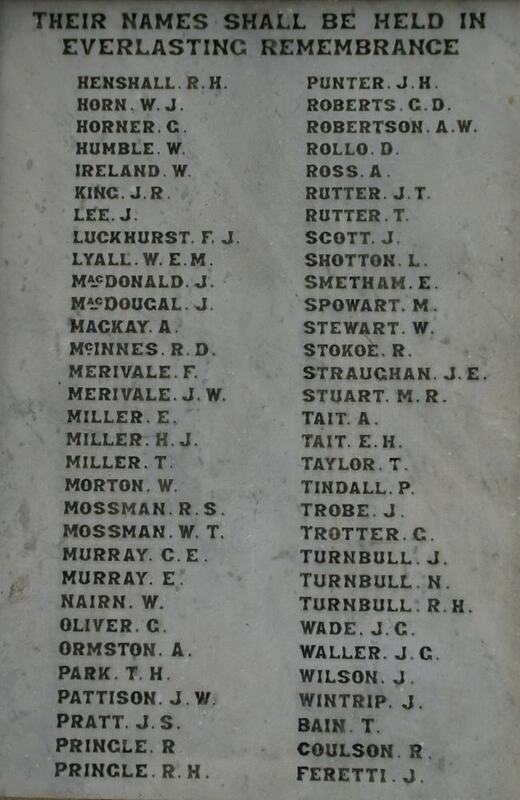 Son of Albert Scott Mossman and Jessie Mossman, of Amble, Northumberland. Commemorated Tower Hill Memorial, London. Redpath. R. 1720327 Private Ralph Redpath, Pioneer Corps Died 3rd August 1944 aged 33. Son of Alexander and Jane Redpath, of Amble; husband of Mary Redpath, of Amble. Buried Amble West Cemetery. Riddell. N. G. 616809 Sergeant (W.Op.) Norman Grey Riddell, 206 Sqdn. Royal Air Force Died 20th December 1940 aged 21. Son of James Robert and Ellen Jane Riddell, of Amble. Buried Amble West Cemetery. Shearer. L. Engineer Officer Alexander Lloyd Percy Shearer, M.V. Clifton Hall (West Hartlepool) Merchant Navy. Died 12th June 1942 aged 29. Son of Mr. and Mrs. A. Shearer; husband of Ivy Shearer, of Amble, Commemorated Tower Hill Memorial London. Stewart. J. G. 566189 Sergeant (Air Gnr.) John George Stewart, 30 Sqdn. Royal Air Force. Died 15th November 1940 age 24. Son of John William and Susan Stewart, of Amble, Northumberland. Commemorated Tirana Park Memorial Cemetery, Albania. Stone. N. 4273854 Fusilier Noah Stone, 9th Bn. Royal Northumberland Fusiliers. Died 12th September 1944 aged 25. Son of Stephan and Margaret Stone; husband of Catherine M. E. Stone, of Boulmer, Northumberland. Tate. J. H. K. Galley Boy John Henry Kempster Tate S.S. Condylis (Greece) : Merchant Navy. Died 10th August 1942 aged 17. Son of Henry Kempster Tate and Elizabeth Tate, of Amble, Northumberland. Commemorated on the Tower Hill Memorial, London. S.S. Condylis Greek registered merchant ship of 4439 tons torpedoed and sunk North Atlantic by U660 and U438. 9 killed 26 survivors.